King Min Saw Mon built five city-settlement pagodas and eight Nat figures simultaneously when he founded the city of Mraukoo. By naming the mountains inside and outside the city, he erected many pagodas on such mountains. The city was founded in the form of Galone bird incubated spreading his wings. By building the pagoda in the place of Galone bird’s head, it was called Myotookhaung pagoda. The pagoda stands on the spur of Pinay mountain which is half a mile away from the north-west of the palace site. In other words, the pagoda was called Myotoohnauk pagoda because it was built enshrining the brain relics of Buddha and the relics of Arahats in it. After the city-settlement pagodas had been built, this pagoda was built as the subsidiary city-settlement pagoda in AD 1430. 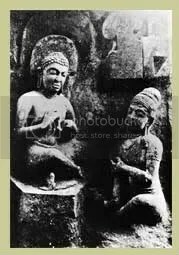 In the past, it was a cave pagoda, and the stone Buddha image which is eight fee high and worn the lotus robe, was in the cave. The throne on which Buddha image sits, has a variety of flowers and figures. Among the figures, the harpist in the form of playing the harp, was included. By observing at that figure, it evidences that Rakhine people have been able to play the harp professionally sine the 15th century. The prayer hall covered over the cave and Buddha image. Nowadays, the cave had destroyed and only 66 feet high wall, remains. The board of trustee takes care of it.